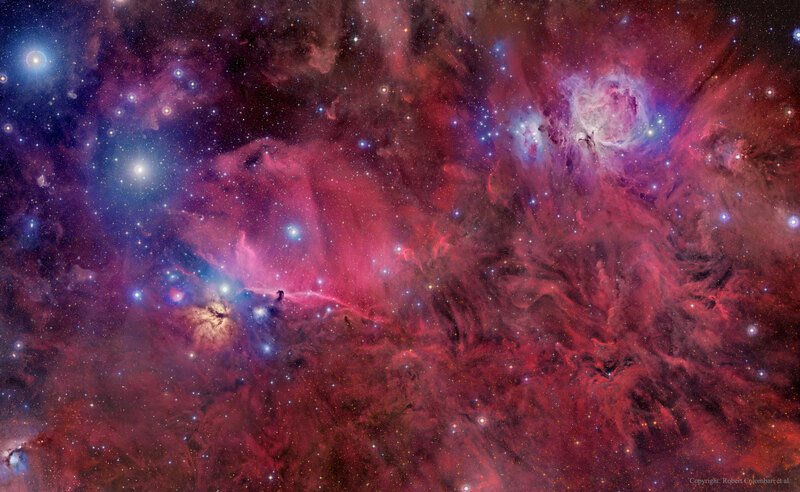 Explanation: The constellation of Orion holds much more than three stars in a row. A deep exposure shows everything from dark nebula to star clusters, all embedded in an extended patch of gaseous wisps in the greater Orion Molecular Cloud Complex. The brightest three stars on the far left are indeed the famous three stars that make up the belt of Orion. Just below Alnitak, the lowest of the three belt stars, is the Flame Nebula, glowing with excited hydrogen gas and immersed in filaments of dark brown dust. Below and left of the frame centre and just to the right of Alnitak lies the Horsehead Nebula, a dark indentation of dense dust that has perhaps the most recognized nebular shapes on the sky. On the upper right lies M42, the Orion Nebula, an energetic caldron of tumultuous gas, visible to the unaided eye, that is giving birth to a new open cluster of stars. Immediately to the left of M42 is a prominent bluish reflection nebula sometimes called the Running Man that houses many bright blue stars. The featured image covers an area with objects that are roughly 1,500 light years away and spans about 75 light years.